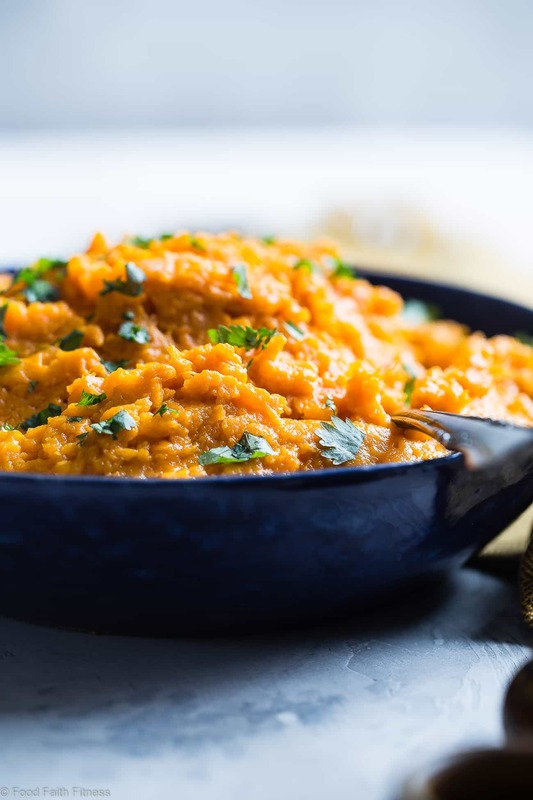 These Curried Savory Vegan Healthy Mashed Sweet Potatoes are a sweet and spicy spin on a holiday classic! So creamy you will never believe they are dairy, grain and gluten free and paleo/whole30 compliant! It’s truly amazing the things that you find when you move. For instance, the life time supply of Kraft Dinner that I found in the back of our cupboard. Seriously, there is SO many boxes of it guys, and it’s not something we EVER eat. The Hubster says he bought it from Costco awhile back, before we even got married and it somehow ended up in our house? Leave it to Costco to sell Mount Kilimanjaro sized boxes of products. I do love Costco though…all those delicious little samples from the nice ladies in white and red aprons! I remember I used to always try to change my appearance so I could go back to the good sample tables twice, and try to pull a fast one on those ladies. You know what though? It actually worked more often than not! Life lesson: Never go to Costco when you are hungry, unless you want to have to sell your first born child to pay for your grocery bill. Side note: Don’t actually try that, they don’t accept children as payment- just visa and cheques. Anyway, shall we move on to the actual recipe? 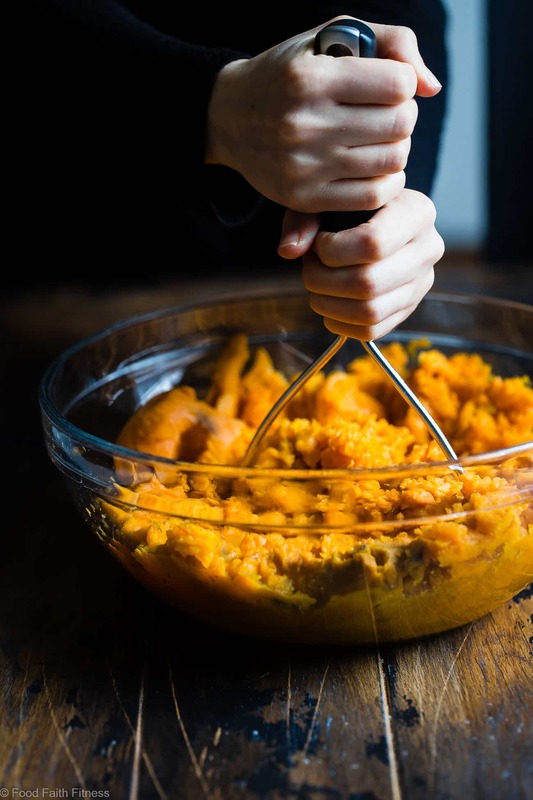 You know what is so great about this Curried Savory Vegan Healthy Mashed Sweet Potatoes recipe? Well, many things. And I am about to tell you what. It is super healthy, paleo/vegan/whole30 compliant, super tasty and you just mash it all together in O-N-E bowl! 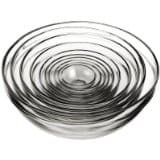 HOLLAH for easy clean up and dirtying minimal dishes! That is huge to me now that oh-so-adorable farm house does not come with a dishwasher. You guys know how I feel about easy prep meals, so this one is right up my ally. Anyone who knows me knows that I <3 sweet potatoes. Like, a lot. vegan coconut curry with Sweet potato noodles, scalloped sweet potatoes, sweet potato salad. I want sweet potatoes ALL the ways, all the time at every single meal forever please and thank you! Before I met kabocha squash, I had that same, obsessive relationship with sweet potatoes. 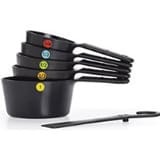 I had them EVERY day for lunch and sometimes dinner too. If I was doctor Seuss, I would say that I could eat them on a plane or a train, I could eat them in a moat with a goat…you get the picture. They are just such a healthy complex carb, that doesn’t need a whole lot of additions to make them taste amazing. I literally just eat healthy sweet potato mash with sea salt usually. Plain Jane. Delicious. As good as plain Jane sea salt is, sometimes you just need that little extra kick to make something ordinary extraordinary. 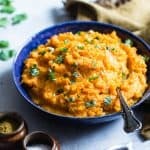 This Curried Savory Vegan Healthy Mashed Sweet Potatoes recipe does just that, without adding much extra cook and prep time either. Peel and roughly chop your sweet potatoes. 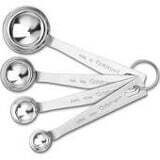 Make sure they are similar size so they cook at even times! 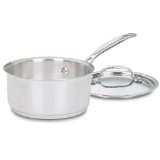 Cover the potatoes in a LARGE pot with 1 inch of water and add some salt. Bring to a boil. Once the taters are boiling, cook them until fork tender. This takes about 20-25 minutes. 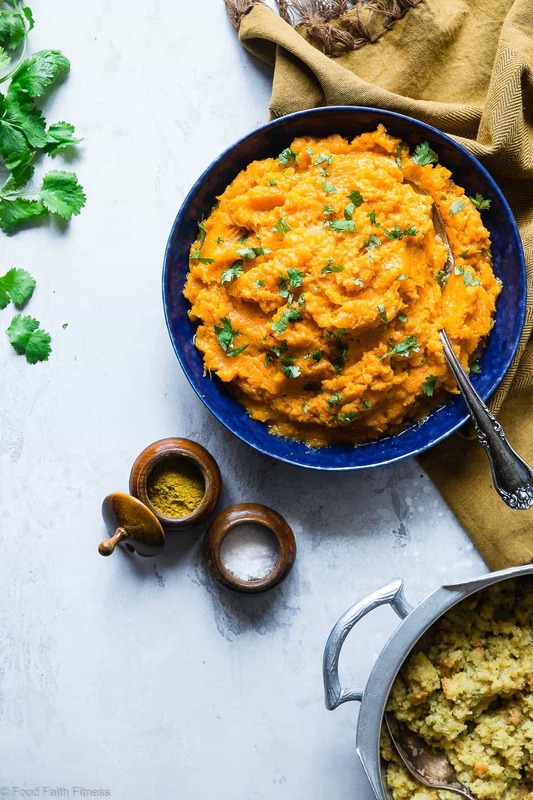 Instead of the usual butter, we’re making this a healthy mashed sweet potatoes recipe and are switching up for heart-healthy coconut cream which swirls around with the spicy curry and rich notes of roasty-toasty garlic to pretty much create the PERFECT potato bite. Serve them up alongside from easy gluten free stuffing, paleo sweet potato cassserole in the slow cooker and cauliflower mashed potatoes and you’ve pretty much got your WHOLE entire Thanksgiving dinner planned. Don’t forget the roasted brussels sprouts with balsamic reduction cause they are SO GOOD. Three cheers to doing a little sweet-potato switch up and basking in spicy-sweet middle-eastern flavored GOODNESS. 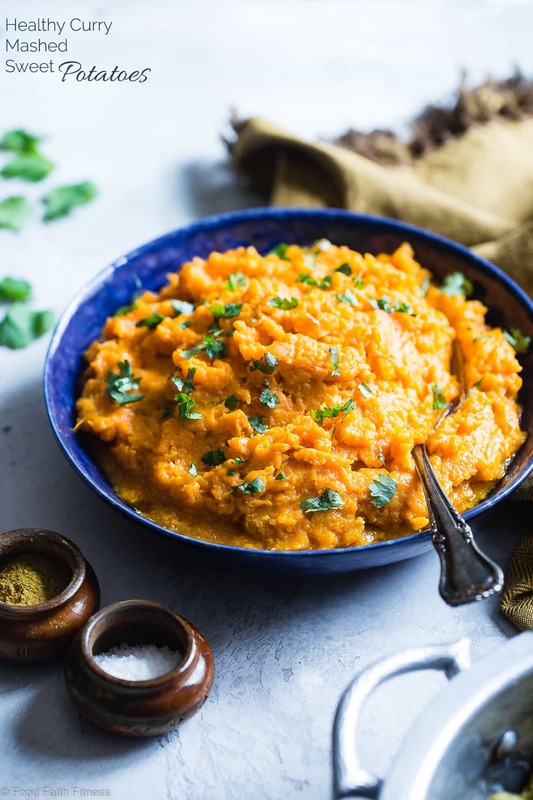 Curried Savory Vegan Healthy Mashed Sweet Potatoes are a sweet and spicy spin on a classic! You will never believe they are paleo and whole30 friendly! Preheat your oven to 400 degrees. Slice 1/4 inch of the top of the head of garlic, peeling off the excess papery skin, and trying to keep the head intact. Place the garlic onto a piece of tinfoil and drizzle with the oil, rubbing into into the top and sides of the garlic. Close the tinfoil to make a packet around the garlic (remember to put the shiny-side in!) and roast until the center of the garlic is very soft, about 40 minutes. While the garlic roasted, place the potatoes into a large pot and cover with 1 inch of water, adding a pinch of salt. Bring to a boil on medium/high heat and cook until fork tender, about 20 minutes. Drain and set aside to cool for 5 minutes. Add the remaining ingredients, up to the cilantro. Squeeze the cloves of garlic out of the head and finely dice them. Add in 4 of the diced cloves and then mash everything with a potato masher. Taste and adjust salt, curry powder and garlic - adding more diced cloves if you want more garlic flavor. Stir in the cilantro and DEVOUR! *I like this with 3 tsp of curry powder, but Mr. FFF thought it was too much. Start with 2 and adjust to what you like. My mom loves sweet potatoes but she always does the same old thing with them. Pinned to make for her later. I can’t wait to surprise my family at Thanksgiving with this new recipe! What do you use for your “Curry Spice”. There are so many options and it makes a huge difference in the flavor. Totally! I love Mccormick brand yellow curry powder! 🙂 I hope your family loves this! I know some will, and I already know who won’t even try it! I just won’t mention the “Paleo/Vegan/Curry part until after they taste it…….. They are slowly getting used to our new eating habits but they’re still apprehensive. When you do a whole 30 in November, you need recipes just like this! Thank you!!! Oh, I can’t wait to try this!!! I have a Pinterest board called “torturing my family for the holidays” because they always make fun of my vegan recipes, but I have a feeling this will be a winner 😉 thanks so much for sharing!! HAHAHA I LOVE that board name!! I hope they LOVE!! Love these sweet potatoes Taylor! Love the idea of adding curry too. Perfect way to add some spice to thanksgiving! Thank you so much girlfriend! Love a little spicy kick! This looks delicious. I’ve used coconut in Buttersquash soup and I bet it’s good in sweet potatoes too. This si a great Thanksgiving side dish! I hope you love it! Coconut IS so good with butternut squash soup! My record of eating sweet potatoes was three pounds of Japanese sweet potatoes from Trader Joe’s. SUPER filling, but totally worth it! 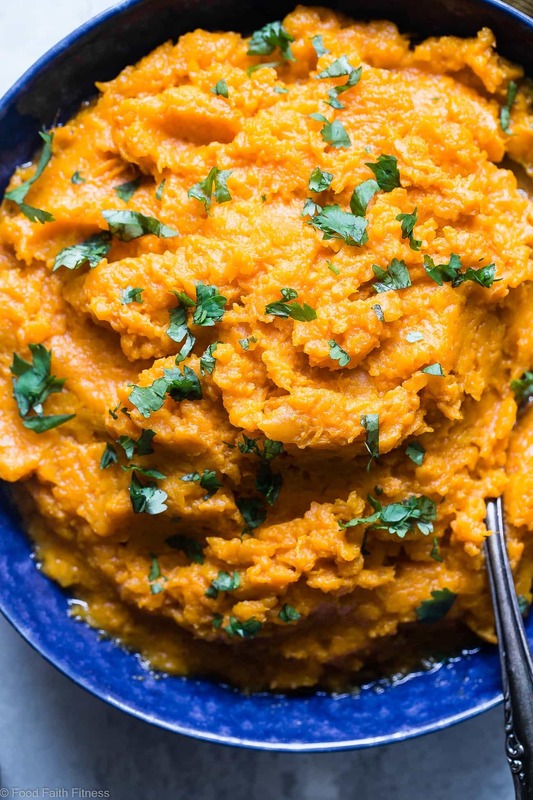 I’d probably smash down this entire sweet potato mash! No shame. This looks like the perfect side with the rest of the Thanksgiving dishes!